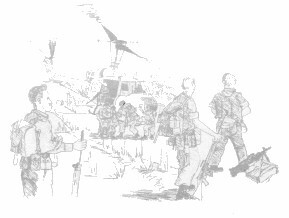 Operation BRIBIE was a quick reaction operation which was launched at 1300 hours on the 17th February, 1967, to establish a blocking position and prevent the withdrawal east of an enemy force that had unsuccessfully attempted a major ambush on Route 44, between Dat Do and Phuoc Hai on the night of the 16th and 17th February, 1967. The Battalion was inserted in two groups. C Company mounted on the Armoured Personnel Carriers of A Squadron, Ist Cavalry Regiment, was ordered to move direct to the position. 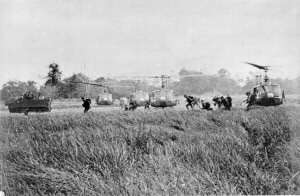 The remainder of the Battalion was air-landed by air assault. The rendezvous for both groups being effected in the area of the Landing Zone, adjacent to the proposed blocking position. There were two major actions. 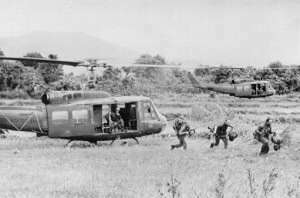 A Company's initial contact with a Viet Cong dug-in position of at least company strength, immediately after it landed whilst it was carrying out its task of securing the LZ. This was followed by B Company's quick attack on the position which developed into a four-hour battle at close range, ending with the Company breaking contact just before last light. At 1345 hours A Company made an unopposed air assault onto the LZ and began to deploy, securing the southern edge of the LZ. Within five minutes of landing 2 Platoon encountered severe enemy small arms fire, and simultaneously 3 Platoon on the left flank was met with light fire, when it reached open enemy pits.Company Headquarters also came under sniper fire at this time. 2 Platoon assaulted the enemy position killing several Viet Cong with small arms and grenades; at the cost of 6 casualties. At least five or six enemy machine-guns were firing, which meant that a sizable force had been engaged. Increased movement to the front, and a larger volume of small arms fire, proved that the enemy were aggressive and prepared to defend the position. 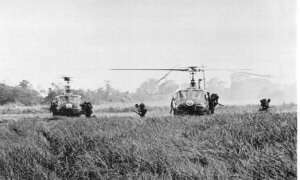 With the arrival of B Company in the second assault wave of helicopters, A Company pulled back to the jungle edge to evacuate their wounded, while B Company moved south-west to engage the enemy. At this stage the Commanding Officer landed and assessed the battle. The orders were for B Company to assault south-east on to the objective and for A Company to provide fire support from the left flank. D Company on arrival blocked to the east, and C Company with the APCs were positioned to the north-west . At 1550 hours, B Company crossed the Start Line with two platoons up, and almost immediately came under sustained sniper and machine gun fire. The advance continued until 4 Platoon became pinned by heavy machine gun fire from the left, and 6 Platoon then moved through them to continue the assault. After 6 Platoon's advance was halted by heavy fire, 5 Platoon made a final assault on the right flank against a series of machine gun positions. This assault, using grenades and platoon weapons, was accompanied by close effective fire from both the mortars and the artillery, but heavy casualties were sustained. The terrain was close scrub savannah. 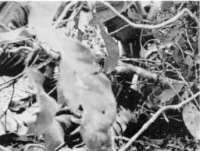 The enemy pits were sited most skilfully, invariably located under a heavy canopy of low vegetation and well camouflaged. The firing was at a range of 30-60 metres. The extraction of casualties was imperative, but proved difficult under enemy fire. and any attempt to reach the forward elements who were pinned down, brought more enemy machine gun fire into the area. APCs moved into the timber to assist in the casualty evacuation. 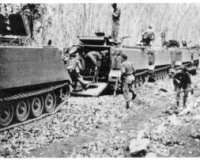 The enemy opened fire with anti-tank weapons, knocking out one of the APCS. The enemy moved forward to assault, only to be beaten back by the fire of the APCs and B Company. By now there was only 30 minutes of light left and B Company were ordered to break contact and move to a battalion harbour position. No sooner had the companies pulled back, than air strikes and artillery pounded the area. Just after first light on the following morning C and D Companies assaulted the enemy position, to find that the enemy had withdrawn. The position appears to have been an enemy concentration area, used both before and after the ambush, the Viet Cong holding the ground until their Command Group had been able to withdraw. 50-70 casualties, assessed by Intelligence. Own Casualties 7 killed in action 26 wounded in action 1 killed in action and 1 wounded in action from A Squadron Ist Cavalry Regiment. 2 Rifles - 1 6Omm mortar sight.